Actress-singer Priyanka Chopra has announced a new project, a film with none other actress-producer Mindy Kaling that will be a wedding comedy. Actress-singer Priyanka Chopra has announced a new project, a film with none other actress-producer Mindy Kaling! Writer and television producer Dan Goor will also be collaborating with the two ladies on the film. Priyanka will produce the film under her production house Purple Pebble Pictures, Mindy Kaling under her banner Kaling International and Howard Klein for 3 Arts, along with Dan Goor. Priyanka took to Twitter to share an article announcing her next film, saying, "Two women with a passion for telling good stories, just got the green light to THEIR story THEIR way. So proud of this incredible partnership with @mindykaling and @djgoor! We are about to show you what it means to be modern, global, and Indian. See you at the cinema!" Mindy Kaling called the association her "dream team". She said on Twitter, "My dream team is making a movie. Can't wait for this one! @priyankachopra #DanGoor". While Dan Goor said on Twitter, "Two amazing women and one guy who doesn't know how to properly tuck in his shirt." The film will be a wedding comedy and be written by Mindy Kaling and Dan Goor. Universal Pictures won a bid at an auction to pitch and develop the film. Reports say the Priyanka Chopra and Mindy Kaling wedding comedy will be developed as a mix of the hit Crazy Rich Asians and My Big Fat Greek Wedding. Priyanka Chopra had recently appeared with husband Nick Jonas in the comeback song of the Jonas Brothers called Sucker. The song was No.1 on many charts. 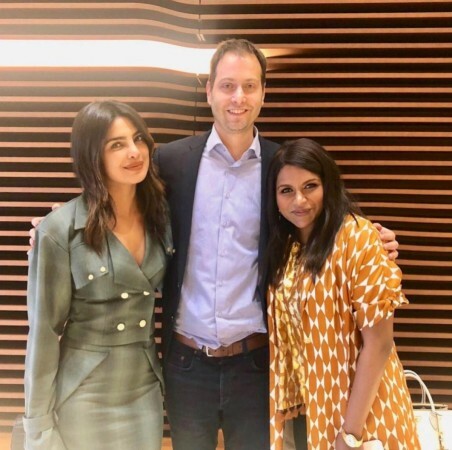 Priyanka Chopra also recently did a show for YouTube Originals, If I Could Tell You Just One Thing where she interviewed three high-profile female celebrities. Read the review of If I Could Tell You Just One Thing here. In Bollywood, Priyanka Chopra will next be seen in Shonali Bose's film The Sky Is Pink, based on motivational speaker Aisha Chaudhary. The movie stars Farhan Akhtar as Priyanka's husband and Zaira Wasim as their daughter.